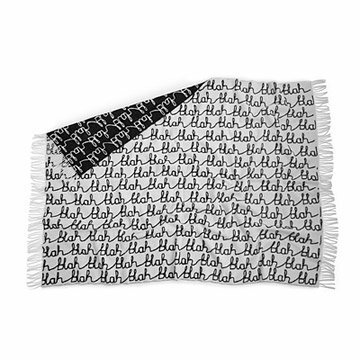 Shut out life's daily blah's with this cheeky lambswool throw. Made of 100% Scottish lambswool, this luxurious throw is the perfect antidote to the life's everyday stressors. Textile artist Donna Wilson has been heralded as one of the United Kingdom's most adventurous designers. Inspired by the days of grade-school penmanship, Wilson created this cheeky "blah blah" print to immortalize the moment she'd stop paying attention and start daydreaming. Woven in Scotland and fully-reversible, this delightful blanket offers a cozy respite at the end of a long day. Handmade in Scotland. Described by critics as a “material marvel,” Donna Wilson has been heralded as one of the UK's most exciting textile designers. Donna studied Textiles at Gray’s School of Art in Aberdeen, then went on to gain her MA in Mixed Media at the Royal College of Art in London. Donna set up her company in 2003 after her odd knitted creatures sold out at her final show at the RCA. Since then Donna has built her business designing and making curious cushions, luxurious lambswool blankets, and a variety of friendly products for the home.